Join the Baltimore Family Bike Party this weekend for a special overnight bike camping trip to Robert E. Lee Memorial Park at Lake Roland in Baltimore County. In bikecamping terms, this ride is a sub 24-hour overnight (S24O) leaving Baltimore for Robert E. Lee Park on Saturday afternoon and returning to the city on Sunday morning. Read on for more details about the park and our planned route! Family Bike Party Camp Out 2014! Please sign up online ASAP then you can optionally RSVP on Facebook! Want some inspiration on how much fun bikecamping with kids can be? 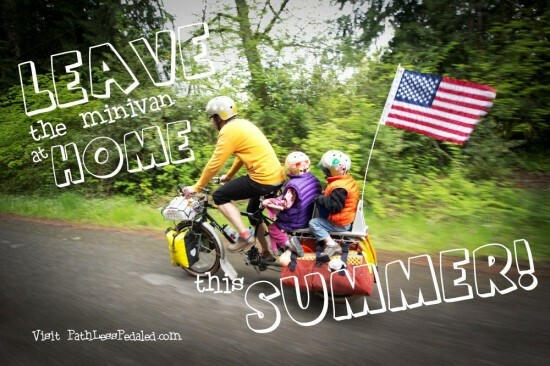 Check out these posts on family bikecamping trips in Seattle and Portland. Need advice on what to pack? Check out this gear list and other resources on overnights from the Adventure Cycling Association. Why go to Robert E. Lee Park? Robert E. Lee Park is a great place for Baltimore families to try out bikecamping because it is only a 8.5-mile ride from Midtown Baltimore or less if you’re leaving from Charles Village or Hampden. The park includes 415 acres of woodland, wetlands, serpentine barrens, rare plants and rocky plateaus. We will be able to use the grills at the Pavillion, the fire ring, and wood for a campfire and a brand-new playground a short walk from the campground. We can have between 16 and 40 people in our group. Participants must bring cash or check to pay the group camping fee of $5 per person to park staff. Following park rules, staff from the Baltimore County Department of Recreation & Parks will be camping with us. We plan to return on Sunday by the same route leaving the park by 9:00am at the latest. Our planned route to the park is mostly on streets with bike lanes or trails and the hills are long but mostly gradual. If you’re feeling nervous about the length or steepness of the ride, you can also bike to the Light Rail, take it to the Falls Road station, and then bike into the park along the boardwalk. Questions? Suggestions? Please get in touch or email ride organizer Patrick McMahon at patrick@mcmahon.com. Previous Previous post: Registration for Baltimore “Bikes Rule at School” Week now open!